It’s remotely possible that even those folks who consider themselves “serious” Buddhists may not have gotten around to reading the Nigrodhamiga-jataka (part of the Pali Jataka, a collection of 500 stories about the Buddha’s earlier lifetimes). Somehow, I find myself able to forgive such lapses. However, in addition to being a renowned writer of, among other things, childrens’ books, Rafe Martin has apparently delved into it — at least the first few stories. 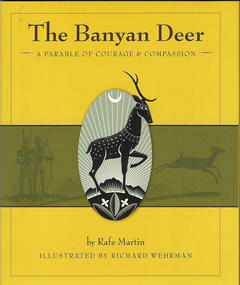 Martin’s latest book, a slim volume entitled The Banyan Deer, is a not-too-modernized retelling of one of the Jataka tales (number 12). The writer has stayed with the common construction of Buddhist parables and allegories, building on the central theme, step by step, until the lesson is completely delivered. This repetitive form is common in oral storytelling. The repetitive and progressive structure helps listeners learn the stories themselves so that they can pass them along in their turn. The Banyan Deer has an archetypical theme that speaks to all compassionate hearts, especially those of children. Martin tells the story of the deer king Banyan who, through his compassion for the members of his flock, turns the heart of the human king who has been hunting them and convinces him to spare them and their descendants from further hunting. This teaching and conversion theme is another that is common in Buddhist folklore, and it carries a message that is critical to Dharma in the present day. to let it fall so heavily on others. freedom was bought at such a price? …”Imagine that,” said the young deer. Rafe Martin has told a story that is especially suited for reading to children. It has the feel of one of those tales from my childhood that I constantly nagged the adults to read to me again, pleeeeease? Don’t get the idea that it’s just for kids, though. Its lesson addresses the major problem in the world today, and its concepts of interbeing and compassion could well be our salvation in a physical sense — no metaphysics required (nor desired). copy of the book in return for this review. 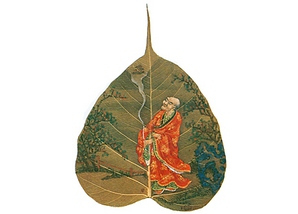 Categories: Buddhism, Compassion, Dharma, Entertainment, Ethics, Peace, Philosophy, Right Action, Right Livelihood, Right Speech, Right Understanding | Tags: allegory, Buddhist folklore, fables, The Banyan Deer | Permalink.